Priorat or Priorato is a tiny isolated region just west of Tarragona, in Catalonia. It's an ancient wine region where vines have been planted since before the Romans arrived to mine of lead and silver. Priorat was named after the Spanish word for "Priory", refering to the presence of the monks during the middle ages, that established a Carthusian Monastery. The famous wines of Priorat are all reds, and are some of Spain's most powerful, intense, inky, and massively structured wines. They tend to be high in alcohol and tannin, and have thick port-like textures and are loaded with ripe blackberry, chocolate, and licorice flavors. The rugged terrain and poor, rocky, slate-laced soils are in-part responsible for the concentration of these wines. The low-yielding old vines also make for very intense fruit. The climate in Priorato is intensely hot during the day and very cool at night. The vineyards are planted over valleys and slopes that reach over 3000 feet in elevation, many of which were planted on terraces built centuries ago. These vineyards are mostly planted to two native red grapes, Garnacha and Carinena. There is also quite a few vineyards that use small amounts of Cabernet Sauvignon, Merlot, Syrah, and Tempranillo. 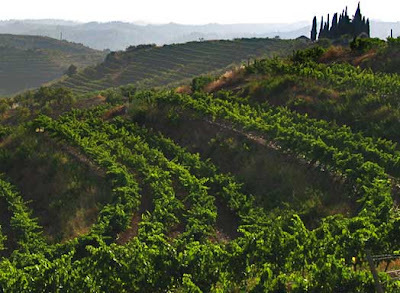 Unlike the wines of Rioja and Ribera del Duero, the wines of Priorat are not categorized by or according to the hierarchy of Crianza, Reserva, or Gran Reserva.